Brought up amid squalor and poverty in a dead, ugly small town, young Joe Lampton has one ambition: to escape the anonymous, defeated crowd of “zombies” and make it to the top. Everything seems to be going according to plan when he moves to a new city, finds a good job and new friends, and inspires the love of a pretty girl with a rich father. Only one thing holds him back: his passionate affair with Alice Aisgill, an older married woman. Forced to choose between true love and his dream of wealth and success, Joe will have to make a terrible decision, with violent and tragic consequences. 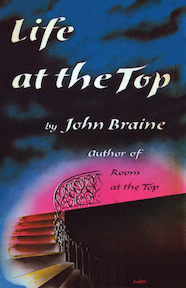 Room at the Top (1957), the first novel by John Braine (1922-1986), earned widespread critical acclaim and was a runaway bestseller in England and America, running into dozens of editions and spawning a sequel and an Oscar-winning film adaptation. Still explosive more than half a century later, Braine’s classic of the “Angry Young Men” movement returns to print in this edition, which features a new introduction by Janine Utell and the original jacket art by John Minton. John Gerard Braine was born in Bradford, Yorkshire in 1922. He sprang to immediate fame in 1957 with publication of his first novel, Room at the Top, which was a critical success and a major bestseller in England and America and was adapted for the screen in an Oscar-winning 1959 film starring Simone Signoret and Laurence Harvey. 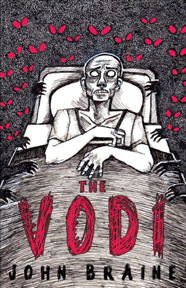 His second novel, The Vodi (1959), met with mixed reviews and a disappointing reception, but was Braine’s favourite of his own works. His next book, Life at the Top (1962), a sequel to Room at the Top, sold well and was filmed in 1965. Braine, who was commonly associated with what the British media dubbed the ‘Angry Young Men’ movement of working-class writers disenchanted with the traditional British class system, continued writing until his death in 1986, though as of 2013, all his works were out of print. Recently, there has been renewed interest in Braine’s work, with Valancourt Books’ reissues of Room at the Top and The Vodi, and a 2012 BBC miniseries adaptation of Room at the Top.